There are a number of flexible and affordable repayment plans for federal loan borrowers. The repayment plans tied to your income are good options for many borrowers. You should review the Department’s repayment estimator to get estimates of your monthly payments under different repayment plans. The repaying out of default section has information about getting out of default through repayment. PLUS loan borrowers have nearly all the repayment options that Direct and FFEL Stafford loan borrowers have, with one big exception. The income-driven plans are not generally available to parent PLUS borrowers. These plans are available to graduate PLUS borrowers. Parent PLUS borrowers who also have other federal student loans and choose to consolidate with Direct will find that the PLUS loan taints the entire consolidation loan and will mean that they will not be eligible to repay the consolidation loan using income-driven repayment. If they wish to consolidate, parent PLUS borrowers may exclude the PLUS loans from the consolidation and pay them separately. These borrowers should also be able to consolidate and choose ICR. If you have federal student loans, you can change plans by contacting your lender. FFEL lenders must allow you to switch at least once each year but most will let you switch more often if necessary. Borrowers with Direct Loans may change plans at any time by notifying the Department of Education. There are some important consequences if you choose to leave some of the IDR plans. Under current policy, if you choose to leave the IBR plan, you will be required to pay under the standard repayment plan. You do not have to leave IBR, however, if you no longer have a partial financial hardship. You can remain in IBR in these circumstances, but your payment amount will be recalculated. This is a big reason why it’s so important to make sure that you respond to all requests for information from your servicer, including the annual recertification process for IBR. 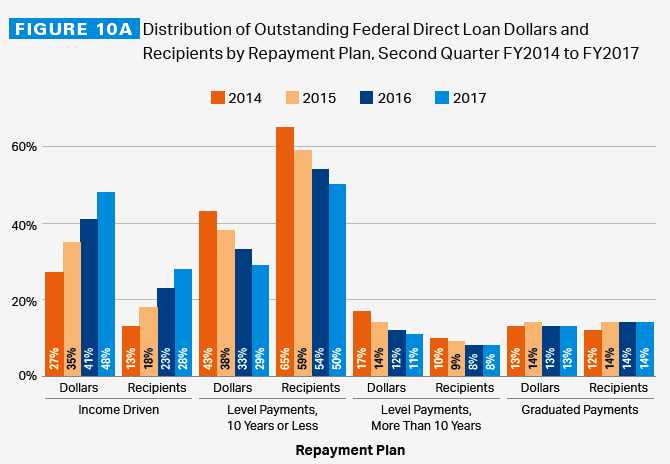 Participation in income-driven repayment plans for federal student loans has grown dramatically in recent years.